Volume 5 Now For Sale! 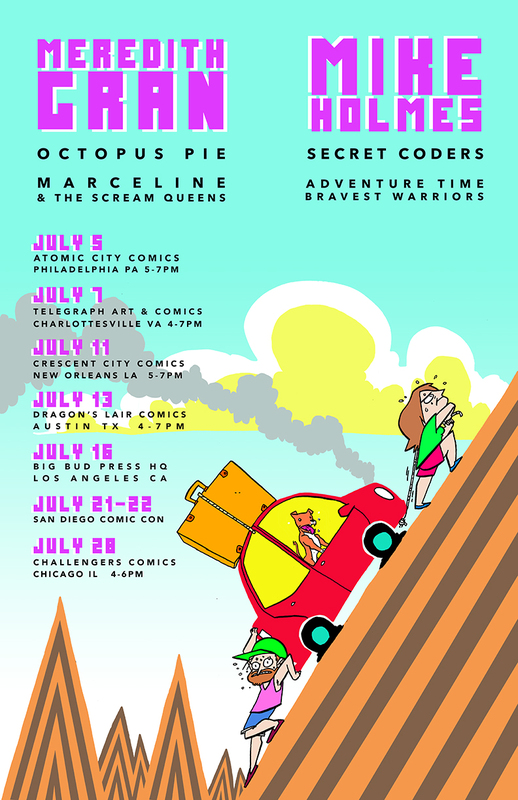 I’m back from my USA book tour, and finally have a window of time to sell some Octopus Pie books directly! If you’ve been waiting to get a signed copy of Volume 5, this is your chance. The other books are also available individually or in a 5-pack. Each copy bought from me is signed - optionally, you can add a sketch as well! This sale will end on Sunday night, August 6th, so hop over there now! If getting a book isn’t enough, there’s a cause as well! Proceeds from the first 50 books sold will be donated to Black & Pink, an organization working with and advocating for LGBTQ inmates. Even if you’re not getting a book, check them out and support the vital work they do. Tonight I will be kicking off a book tour in Philadelphia! Do come out if you're around. Here is a handy poster (drawn by Mike!) of all the spots we'll be hitting this month. See you in your city soon! I put a final batch of OP original art in the store - if you'd like to own a bit of the ending, the bits are available now. I jealously decided at the last second to hold onto the final page. I've sold off so much of my work for the needs of the moment. There are way worse things than seeing those pages on the walls of loving homes. But I do get sentimental. Treat 'em good for me! "Anything That Ever Meant A Damn Took A While"
Friend and comics inspiration Sloane Leong wrote some thoughtful words on Octopus Pie on The Comics Journal. You can read the full piece here. I always love reading Sloane's thoughts on the comics craft, and to be a subject of her commentary is quite moving. You can follow along with Sloane's current and upcoming projects, which I highly recommend doing. Volume 5 Out Today! More Book Tour Dates! Octopus Pie Volume 5 is NOW FOR SALE at your local comic shop! I'm told it will be available in book stores (like B&N) on July 4th. 7/5 - Philadelphia, PA - Atomic City Comics - Facebook event page here! NEW! 7/11 - New Orleans, LA - Crescent City Comics - Facebook event page here! NEW! 7/13 - Austin, TX - Dragon's Lair Comics & Fantasy - Facebook event page here! NEW! 7/28 - Chicago, IL - Challenger's - Facebook event page here! NEW! Links to these event pages and specific times for these signings coming soon. In the past week, there've been some kind acknowledgments of Octopus Pie by friends and academics. Kate Beaton wrote a lovely tribute to the series on her blog. I need not tell you how those words resonate. If you've somehow not enjoyed Kate's work yet, you are in for a treat. Gary Tyrrell at Fleen wrote some very kind words about the series wrapping, as well. Always an encouraging voice -- thank you, Gary! I've been receiving hundreds of notes from readers who followed along for years, and I'd like to thank you all for expressing these things to me. Many have pointed out that they were only a teenager or just beginning their 20s when they first discovered the comic, and have seen a progression in themselves over that time. It's a powerful thing to read. Again, thank you. 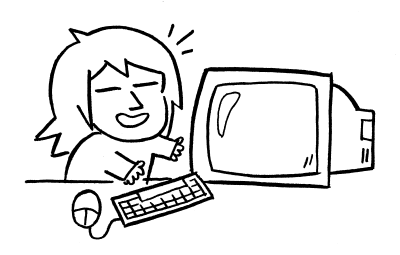 In more official matters, the Octopus Pie website has been archived into the first wave of Webcomics in the Library of Congress! News from WAPO about it here. The webcomics archive includes a focus on diversity in terms of both cartoonists and characters. “I tried to collect female creators because we don’t have a lot of them historically in the mainstream collection,” Halsband tells The Washington Post’s Comic Riffs. Those creators include Allie Brosh (“Hyperbole and a Half”), Kate Beaton (“Hark! A Vagrant”), Melanie Gillman (“As the Crow Flies”), Meredith Gran (“Octopus Pie”), Lucy Knisely (“Stop Paying Attention”), Katie Cook (“Gronk”) and Noelle Stevenson (“Nimona”). Wonderful news! And congrats to all the other cartoonists in this first wave - you can see them all here. Personally, I hope the Library plans to offer more "first wave" webcomics of the Usenet days, early Keenspot fodder, and the remains of BigPanda. I look forward to a future where academics are beaming my stories into their brains.